This recipe is a play on pepper, steak and onions. I’ve always liked it, but this is an Asian spin that I think makes it even better. I will give it to the Asians, they are serious about flavor in their food. Sometimes I get bored with American cooking. I want to make a bold statement that you wont fully appreciate unless you’ve done it too. A few years ago, when I learned how to cook Asian food as good as a redneck can, it changed my quality of life. It seriously opened a new culinary door. The intense flavors have brought some extra enjoyment to me on a regular basis. I give most of the credit of learning to Hank Shaw. You can read about his technique here. Soon after I found another food blog; The Woks of Life. They are American Chinese that share their cooking. It seriously is one of the best blogs I have ever seen. Another big part of authentic Asian cookery is having the right ingredients. Things like sesame oil, Shaoxing wine, light, regular and dark soy sauce, oyster sauce, and fish sauce give your stir fry authentic layers of flavor. I live in the sticks and don’t have an Asian grocery within an hour of me. So, I order in most of these ingredients. But it’s worth it trust me. For this recipe, I’m using offal. Last October I killed two does and saved the hearts. Heart seems like the gateway drug to eating offal. After all it is just lean muscle. Unlike liver and kidney which are not muscles and do not have the same texture. I’d like to see more people utilize these items. Typically they lay with the gutpile and are eaten by scavengers. But, since we are omnivorous scavengers, we are going to utilize these things. I have heard the offal referred to as the 5th quarter. Which might be a misnomer, since there are already extra pieces that might be considered that 5th quarter. What quarter are the backstraps, tenderloins, ribs, and neck included? Maybe those specialty items, along with the offal are considered that 5th quarter. Maybe the backstraps and tenderloins are bonuses since they are prime cuts. On this blog, lets consider the 5th quarter the ribs, neck, heart, liver, kidneys and tongue. Even though just about the entire thing is edible, we are going to take small steps and focus on these items I listed. Certainly the lungs, and stomach are 100% edible but are on the fringe and I’m not quite there. Maybe with more experience I will start experimenting. One thing right off I determined, two hearts is too much for this recipe. I ended up with 22oz of trimmed heart. Stir fry is sensitive to crowding the skillet. It drops the heat too quickly and you loose the nice sear. Also, it prevents the meat from laying in a nice even layer where all pieces sear evenly. 12-14oz is ideal. Since these doe hearts were 11oz, one is enough for this dish. A buck heart would be perfect. You would be better off doing two separate stir fry than one large one. Trim all the valves, membranes, fat and veins off of the hearts. There is a membrane on the outside that is hard to get off, but throws the texture off. I prefer ¼” square strips 2” long or ¼”x ¾” chunks. Pretty small pieces. I thought my pieces were too big which also threw the texture off. There is an outer membrane that is too thin to remove. There is no reason you couldn’t use beaver heart, or any type of bird hearts. 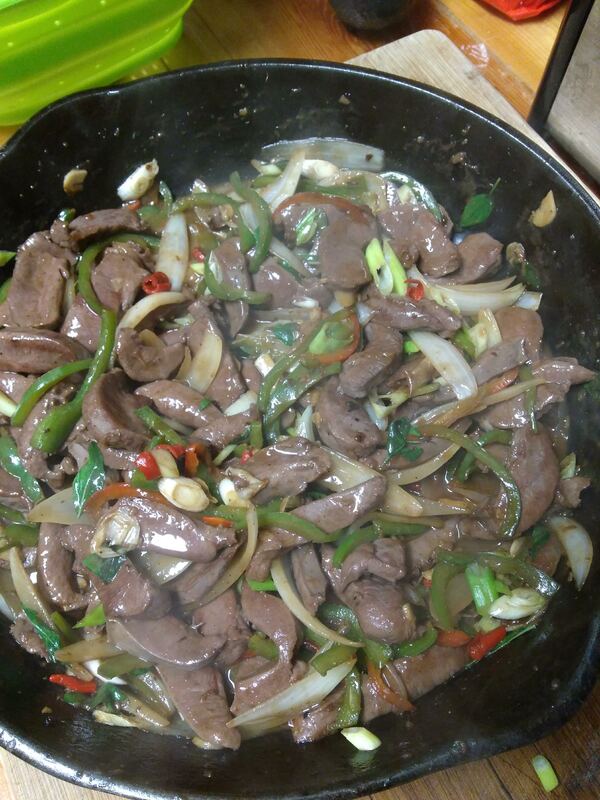 I have used chicken hearts for a similar recipe and they were good. Another basic tenet of stir fry is to have everything cut and ready before you start. You are working with very high heat and will not have time to do any of the prep work while you cook. Chop all vegetables and combine ones that will go in to the pan at the same time. Make your sauce and set it aside. This literally cooks in five minutes so you have to be ready. The basis for this recipe is from The Woks of Life, Beef and Pepper Stir Fry. But I have added onions and messed around with it some. A word on rice; don’t waste money on instant rice or other garbage like it. I have been getting 20lb bags of Botan rice from Walmart. They seem to last a long time and you can tell it is good quality rice. I don’t have a rice cooker, I just use a pot but it is good sticky rice. It is really worth it and buying in bulk is the way to go.